This is one of those races that I miss registering for every year. As in, I always forget about it. I was so mad last year when I logged into social media to see fellow DC runners with their post-race selfies, not only because the medal was pretty with a lovely aqua ribbon, but because I had a 10-mile training run for the 2015 New York City Half-Marathon that day anyway. It’s always a bonus to get a medal for a race that is also a training run! After managing an injury and focusing on strength-training for the last 4 months, I wasn’t quite ready to get back into the racing mindset. I admit that last year, I ran too many races. I didn’t realize that it’s easy to get burned out on running too many races, but it is. And it’s expensive. What I love about this race is that it’s not terribly pricey– less than $50. It also doesn’t have a huge race atmosphere: it felt more like a community fun run than anything else. The race takes place at South Lakes High School in Reston, Virginia. The proceeds for the race go toward the school’s track team, the members of which were also volunteering. I also loved that it was being held at a high school for a number of reasons: lots of parking, a warm building to hang out in before the race, and clean restrooms. It was also right up the street from a Starbucks. This was especially crucial because I did not make coffee or eat breakfast before the race, which started at 8AM. I had plenty of time to enjoy a blueberry scone and a venti dark in my car before the race began. The race is also pretty easy to get to, if you have a car. From Arlington, I took the Dulles Toll Road about 25 minutes to the school, and I got there around 7AM. I probably got there a little too early, honestly. The race is small enough that there’s no need to hurry up and wait, so to speak. I could have waltzed in at two of 8:00 to grab my bib and jump in with the herd. There is also on-site registration, which is great because I know some friends who were still debating joining in the night before. Weather-wise, I knew to expect anything from cool to cold to snow from having seen pictures of the race in the past. The day started out at around the high 30s and migrated to mid-40s two hours later. I dressed for a cold winter run, but realized I could have been totally comfortable in capris instead of fleece-lined tights and I tend to be a wuss about the cold. Regardless, the race has a 2-hour time limit, so it’ll be over soon if you’re uncomfortable on the course. Speaking of the course, prepare for hills. And prepare for constant hills. Prepare also for equal downhills and uphills. 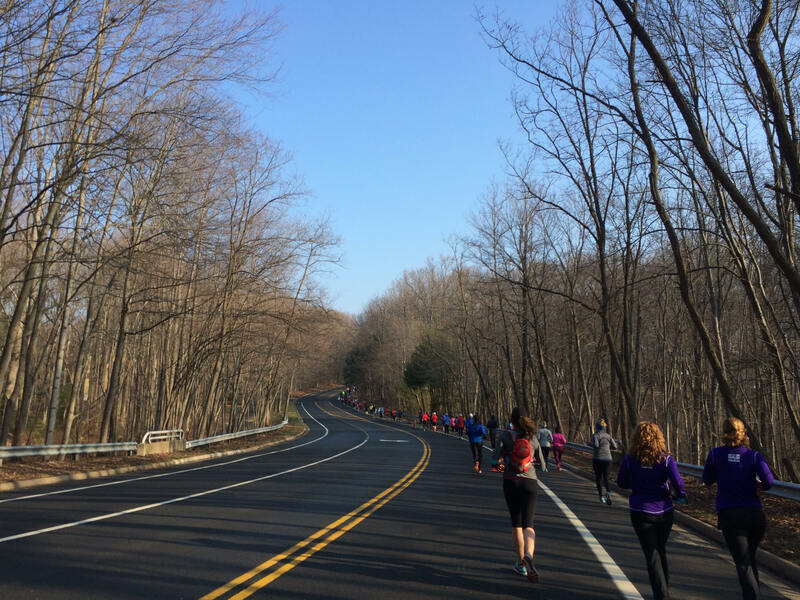 I embraced the hilliness of this course because I learned after running the Baltimore Marathon how under-prepared I was to run hills, plus I have several hilly races on deck for 2016 and I needed the sustained, long-distance hill training. But if you’re looking for a flat course, this race is absolutely not for you. It is, however, quite a lovely course. Reston is a quiet suburb of DC and, for the first 5 miles, it felt like we had the place to ourselves. Once we hit the 5-mile loop, we were sharing the road with cars. Be aware of that and stay within the cones set up to mark the course– some of the cars that passed us seemed to not see us as human beings and blew past us. Getting started, I took a spot at the back of the pack because I wasn’t sure about what pace I wanted to run. It was, after all, a training run that I usually would take at long run pace and not race pace. I instantly realized the mistake of being a fast back-of-packer even at my guesstimated 10:00-11:00 pace neighborhood, and I had to bob and weave through people a lot. I finished my first couple of miles around 10:00 or so while bumping into a lot of run-walkers and their 6-alarm Garmin watches. 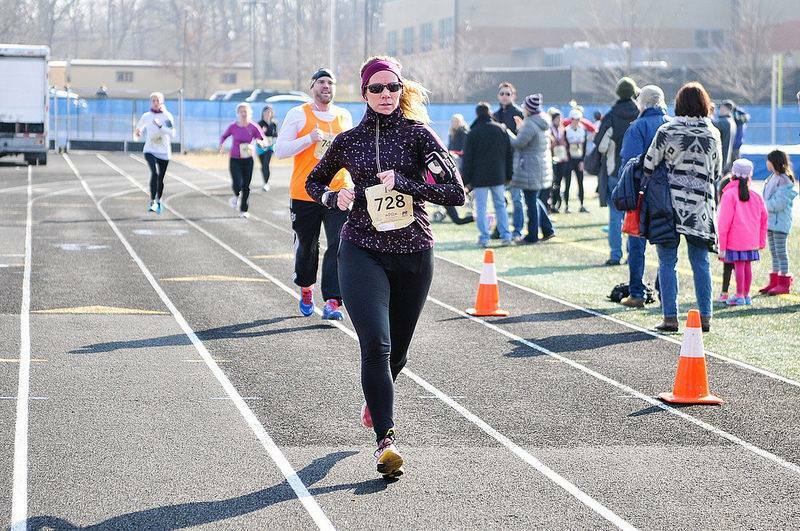 The good thing is, the running field for this race is big enough for everybody, but like any other race, I do recommend sticking to your pace group or close as possible to it. Once I got out of the thick of everyone else and was out on my own a little bit, I focused on maintaining a consistent pace. I am still working on getting my cardio levels back up where they used to be, so going up and over hills took it out of me several times and I had to fight the urge to slow to a walk. But I held fast to my paces, tried to pay attention to form, and ignored my frustration with the elevation or the urge to lose control on the downhills. Course support for this race includes 3 aid stations at miles 3, just before 6, and again around mile 8 with both water and Gatorade. A lot of the volunteers were high school kids who looked kind of intimated at a bunch of grown-ups charging toward them, demanding refreshment, so definitely make sure you tell them thank you! The volunteers did a great job and were very encouraging of us all. Another perk about this race is the free race photography. I saw the photographers here and there, but the photos were available right after the race on the Potomac River Running webpage. My last split of the race was my fastest: an 8:30 pace. It felt easy, too. I’m definitely feeling ready to take on the streets of New York City once again after doing great in the Reston 10-Miler. Another personal accomplishment: I came within just about a minute of my PR, set just this past June at the Baltimore 10-Miler. Crazy, because I didn’t even feel like I had been trying at this race! I’d just been running it for the miles and here I came pretty close to taking down my 10-mile personal best. In closing, I would definitely recommend this race. The finishers’ medal was beautiful, the tech shirt is designed well, and the post-race amenities were pretty great— bagels, bananas, cookies, Nature Valley granola bars, fruit snacks, and the best part: Dunkin Donuts hot coffee. But I really loved the community, close-to-home feeling of this race and feeling like no one was taking themselves too seriously. Definitely put this one on your list for next year, DC runners! Nice job! It is always a great feeling when you run a PR or close PR when you don’t realize it + it is NOT a hilly course. 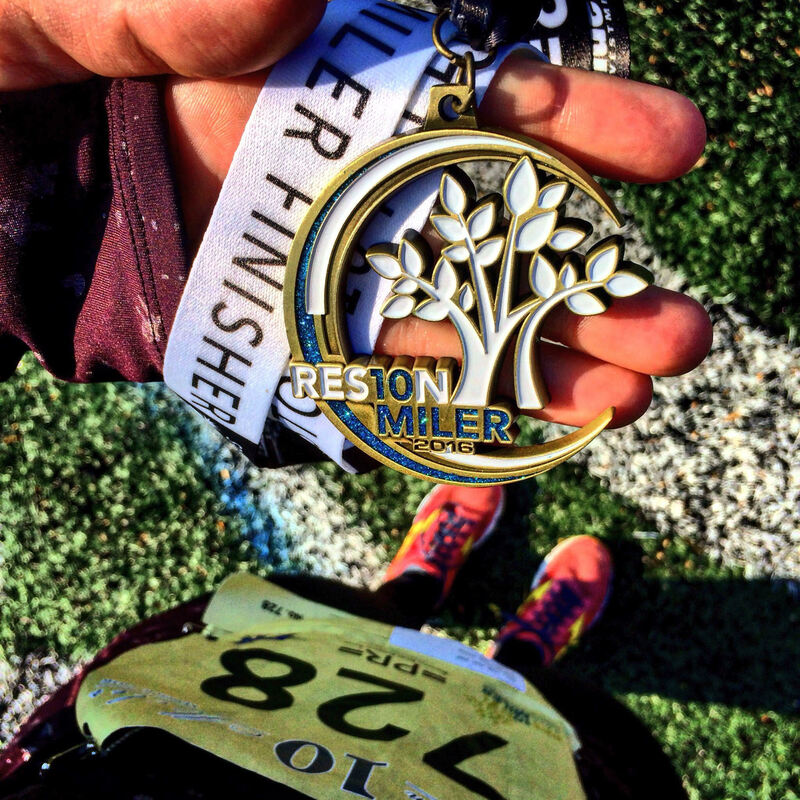 I haven’t run the Reston 10 Miler, but have participated in the Perfect 10K that starts there (I imagine they utilize similar route). Thanks Jennifer! Definitely a good race, and I might do the Perfect 10 in the fall!